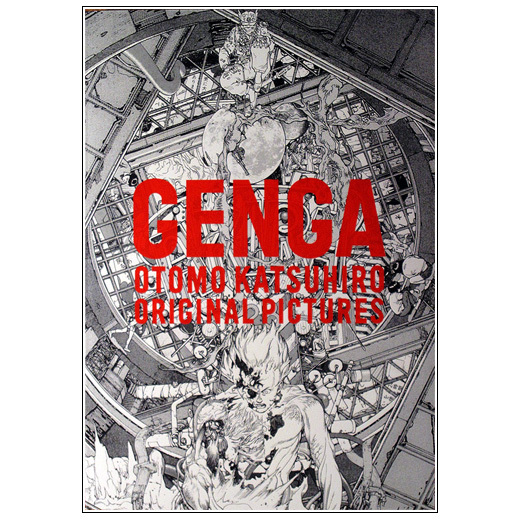 The official book of the recent Otomo Katsuhiro Exhibition GENGA-TEN where, for the very first time, the original illustrations and comic works drawn by Katsuhiro Otomo will be exhibited. 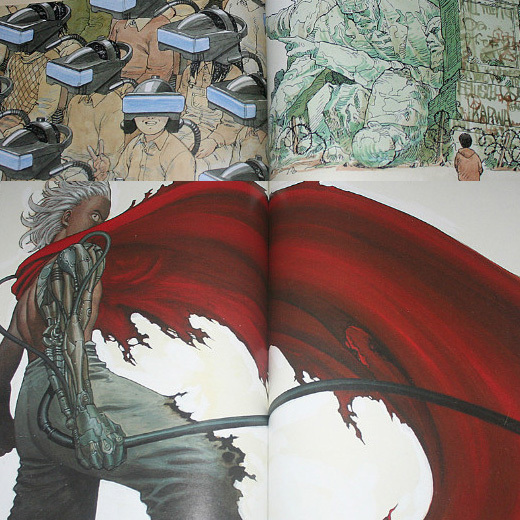 The complete works of Katsuhiro Otomo, one of Japan’s most celebrated manga artists, spanning his debut to the present. Katsuhiro Otomo is one of the most respected and influential Japanese artists/storytellers in the history of modern comics. He has also worked extensively in animation including his own, hugely successful adaptation of his epic manga, Akira, which is widely considered to be a pinnacle of the form—a work of astonishing power and visionary scope, with unsurpassed artistry. 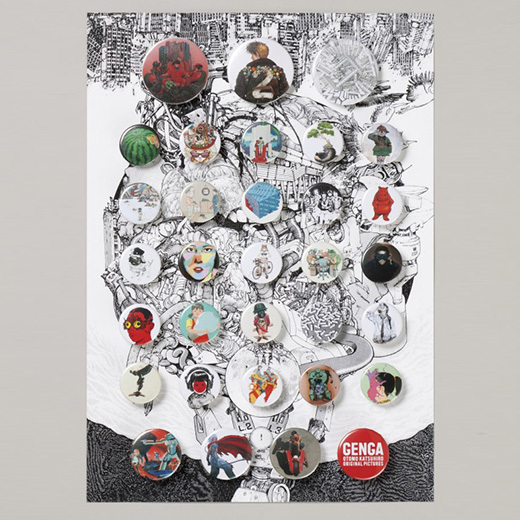 This book is a catalogue for his first major exhibition, GENGA, which included his original drawings from his debut to the present, held in Tokyo from April 9 to May 30, 2012. 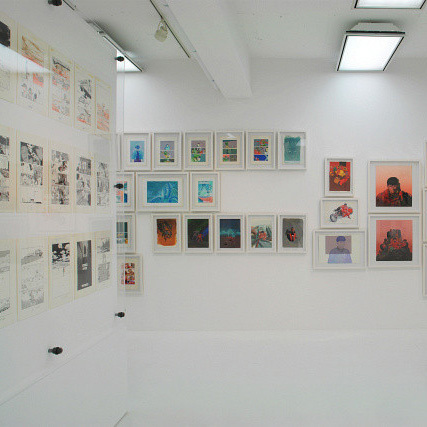 The book contains full-size illustrations of all the works featured in the exhibition, as well as preliminary sketches, production drawings, and the domestic advertising pieces that are rarely seen outside of Japan. 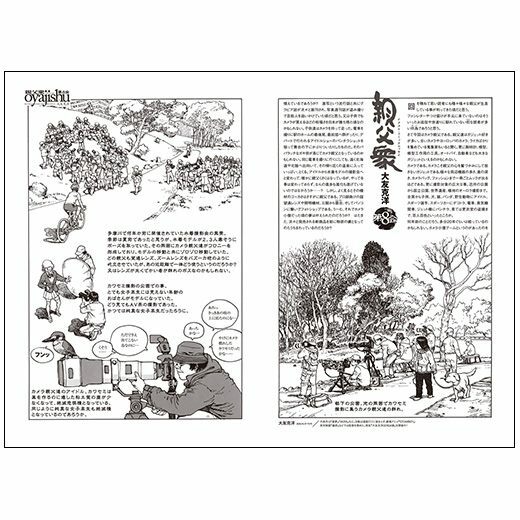 The book also contains interviews and conversations with some of the most famous Japanese film directors and manga artists, such as Akira Kurosawa, Sogo Ishii, and more. Katsuhiro Otomo was in charge of the Character designs for this Volvic water commercial aired in the Japanese TV. This conversation was published in april 2012 issue of BRUTUS magazine and later republished in a BRUTUS special edition issue in January 2014. The text that follows was translated by Mangahakuran in his blog, where you can find really interesting manga and anime related translations to english. Check them out. Inoue: This is where they’re going to hold the exhibition? 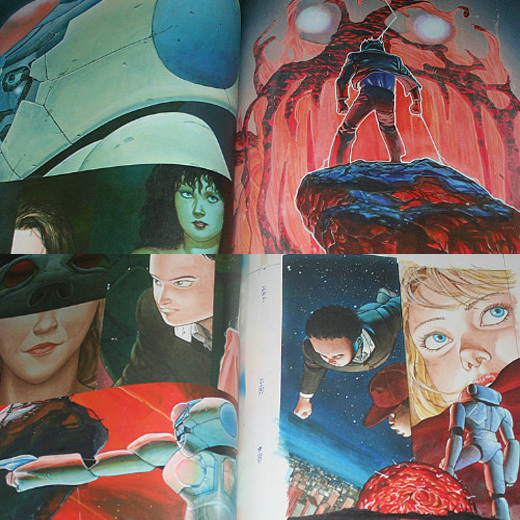 Otomo: This is it. I thought it was too big at first, but I found that once you set everything up it’ll actually get pretty full. You never know until you actually try, I suppose. 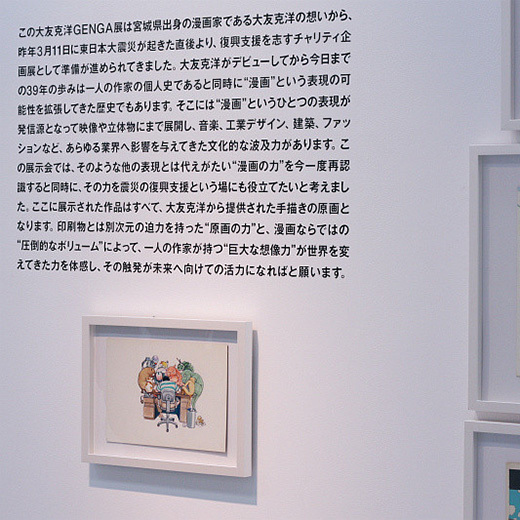 Inoue: So if you’re doing this exhibit with Akira① in its entirety, how many pages does that work out to? Otomo: Should add up to be about 2300, I think. 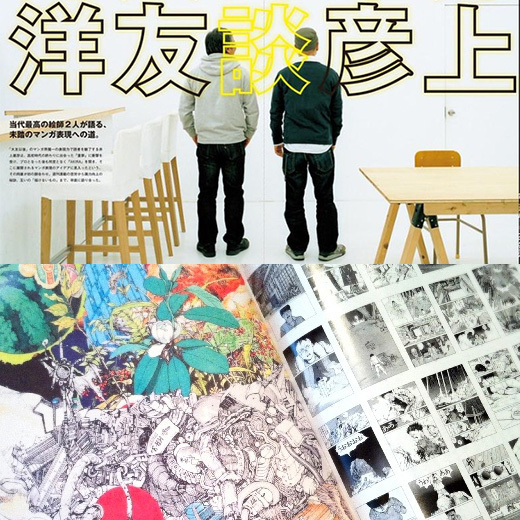 Otomo: What was it you read first? Inoue: Dōmu ②. It was like the door to this whole other world had been opened. Otomo: Part of it would’ve been just a matter of you reading it at the right time. When my generation started making manga in the 70s, we were reading Ashita no Joe ③ and Kyojin no Hoshi ④, and the stories just kept getting darker. Even in other genres, it was a weird time: Film had its new wave, drama had Shuji Terayama ⑤ and the Black Tent Troupe ⑥. In the midst of all that, it was inevitable that manga similarly become dark and moody too. Editor: And then Akira started its run at the end of ’82, when you would have been 28, Otomo. Otomo: Where were you in your career at 28? Inoue: I would’ve been working on the end of Slam Dunk ⑦.
Otomo: I was working on Domu, which I did just before Akira, when I was trying to figure out how to give my manga a cinematic look. I guess that’s basically where my head was at when I was 27 or 28: wanting to experiment with my technique more. It was also around the time I was starting to not have to take out so many advance loans. (laugh) I could go out to have a drink like normal people. Did you ever work as an assistant? Inoue: I worked for Tsukasa Hojo doing City Hunter ⑧ for about ten months. Otomo: Would that have been in Kichijoji? We would’ve passed by each other at some point, then. [Note: Otomo lives in Kichijoji.] When did Slam Dunk start? Inoue: 1990. I’m a pretty simple-minded person, so my inspiration in starting it wasn’t anything more complicated than the idea that basketball was fun. It was essentially my first series — I technically had one before it, but that got the axe after 12 weeks. It was a time where I just kept getting better at it as I went along, learning how to do more and more things. It was really fun. Then I came to the final match, though, and I still had things I wanted to do, so I guess I started to struggle a bit around then… but I’d made up my mind that I’d throw everything I had into the final match, and really I mostly just remember the whole experience as being fun. 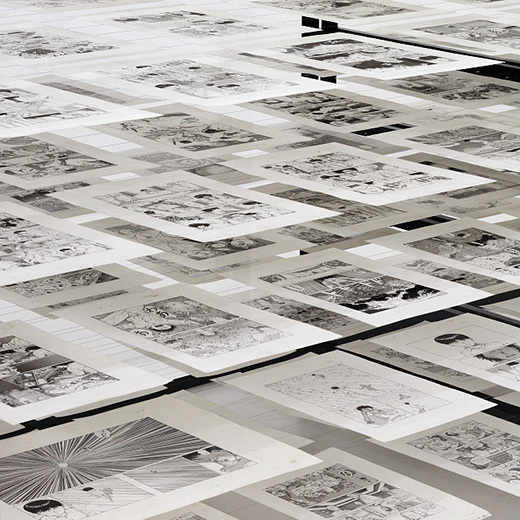 Otomo: That sounds great — having fun, and becoming good at drawing. Doing a weekly series is brutal, though, isn’t it? Inoue: Yeah, I really can’t pull it off anymore. Otomo: How many days did it take you to do a chapter of Slam Dunk? Otomo: So you’d take about five days, I imagine. Otomo: Biweekly, but I was doing it alongside the production for the film too, so I was actually doing 20 pages in a week. Editor: How many people did you have drawing it with you? Otomo: I had two assistants. 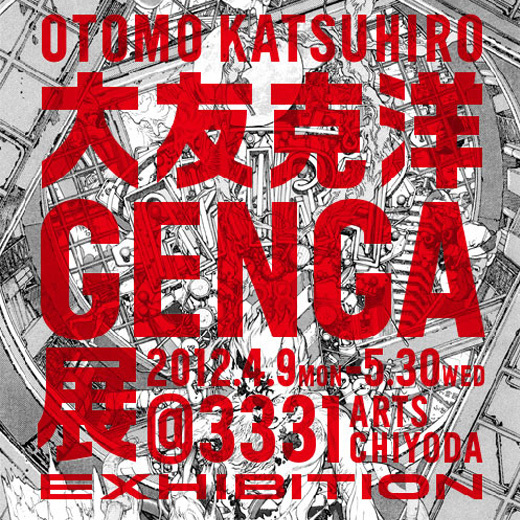 Otomo: Plus a third one sometimes who used to come and do the screentoner. Inoue: I do remember hearing that you drew a lot of the backgrounds yourself. Is that true? 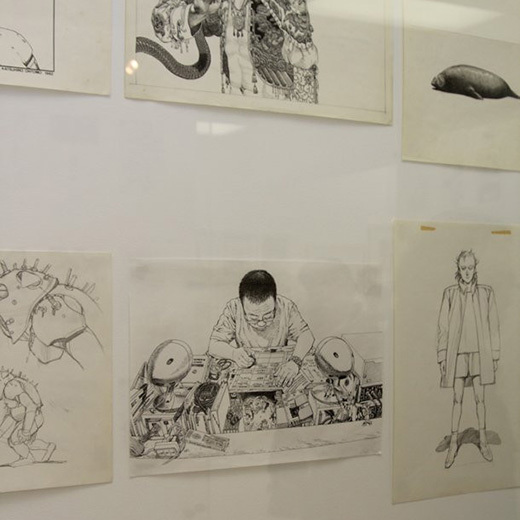 Otomo: I’ve gone back and looked at the old art because of this whole exhibit thing, and I have to say that looking at it now, it’s embarrassing. Inoue: Were you impressed by anything in it? Inoue: Believe me, you did more than just try. What year was it that you first got published? Otomo: ’73, I think it was. It was a piece I’d drawn after coming out to Tokyo, but the art was really dated. For the next year after that, my art style kept changing. That was kind of fun. Inoue: Did you do any time as an assistant? Otomo: I went to help people out sometimes, but I was never really an assistant. I absorbed stuff here and there, and after two or three years I’d reached a certain point. A pretty fun time, even looking back at it. Inoue: Will your art from back then be in the exhibit? 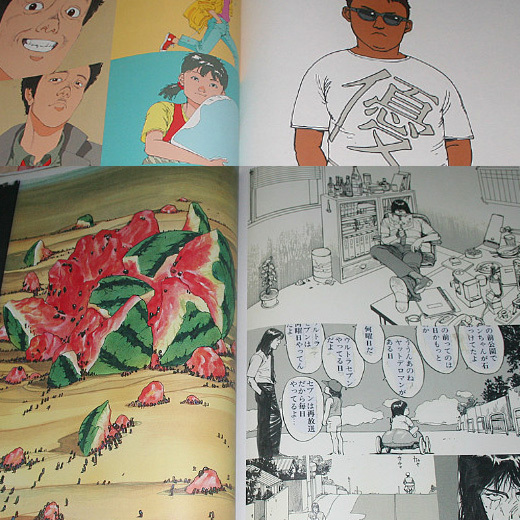 Otomo: Yes, I’m putting it out there, almost out of masochism. (laugh) Do you still have your first published manga? Otomo: See, you don’t ever look at it, right? Inoue: Never. Displaying that really would be downright masochistic. If I ever feel the need to inflict some sort of horrible punishment on myself, maybe I would open it up. Otomo: One always makes tweaks here and there in one’s art as you go on drawing, so the art keeps evolving. All you have to do is buckle down while you’re young and draw as much as you can, and you’ll get really good at it. Manga these days, though, is drawn with symbols — predetermined symbols that people just arrange on the page. That’s not really drawing, and I don’t think someone can make any real breakthroughs that way. It’s important to actually look at things and draw them, I think. Editor: What do you think of Inoue’s art? Editor: Is there a moment when you truly feel that you’ve improved? What’s your definition of good artwork? Inoue: Oh, I’m not any good. At all. Inoue: Hmmm. I think maybe the moment is is when the art stops being so hard, and sort of softens up. In my case, I started out at a really low level (laugh), and I think the process I went through was going from really hard and flat to something softer and more three-dimensional. My manga was pretty simplistic in terms of composition, too, but then I learned to draw from all sorts of different perspectives. It kept me wanting to draw, basically; it kept me from getting sick of it. Otomo: Eventually you hit a point where you feel really free, don’t you? Like you can draw anything the way you want. Drawing for a long time helps you see things you didn’t see before, in terms of composition, in terms of poses. Inoue: What was your experience with doing machinery? 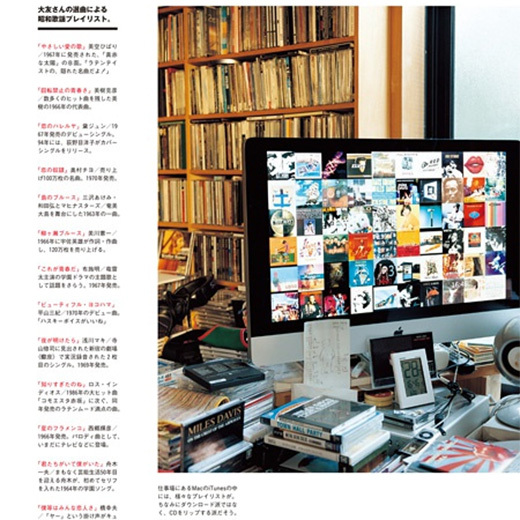 Otomo: I liked machines. It was as simple as that. I like busy, convoluted stuff. Inoue: I absolutely cannot do mechanical things. I don’t have the imagination for it. I was the kind of kid who used to play outside — never did make plastic models or any of that. Inoue: Skyscrapers are something that actually exist, so I can just tell my assistants to go draw them. (laugh) Things that actually exist, I can do. But Otomo makes all kinds of vehicles and stuff that aren’t even real, which is a whole other ballgame. Otomo: But the manga I’m making now is set in the mountains during the Meiji period, so there’s no machinery in it. I’m having trouble doing wild boars at the moment. There aren’t too many collections of photographs of boars out there, so I have to actually go out to see the real thing. Animals are really tough. Trees and water, too. 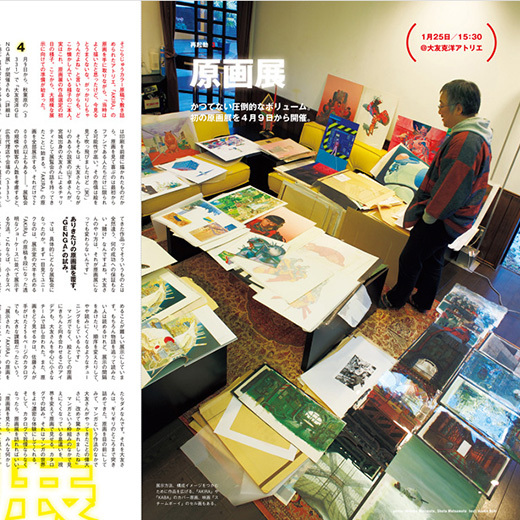 Otomo: Plus, I don’t have any assistants. Inoue: (laugh) I’m resuming Vagabond ⑨ soon. It’s already been decided which issue of the magazine it’ll be, though I didn’t want to announce anything until I’d actually finished drawing it. Otomo: I’m sort of letting the pages build up for now before I start to publish it, which means I don’t have any deadlines for X amount of pages within Y number of days, so it’s not too bad. I’ve been out of the game for a while, so I need to rehabilitate myself, too. Inoue: Ah, so you do need rehabilitation. Sometimes after I take a break for a while and then go back to drawing, I’ll be producing some pretty mediocre art for a while before I start to feel like I’ve regained that touch, which is always a relief when it happens. Otomo: I even just need time getting used to using a pen. I haven’t been using one for quite a while. Inoue: That sounds so nice, having to get used to using a pen. It’s like you’re brand new to the job. Otomo: Pens are tricky. I mean, I’ve still been drawing the whole time, but manga pens — they’re tricky. Part of it is the fact that I use a mapping pen ⑩, which is an especially uncooperative type of pen that even I kind of hate the idea of having to draw with again. Editor: Both of you have had your works translated and brought over to other countries, but Akira was a real pioneer in that respect. 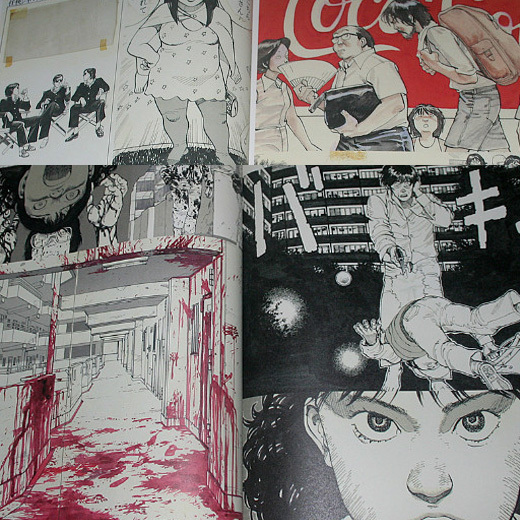 Otomo: It was a lot of work having to flip the pages around for the American version. Inoue: It seems to me they use the Japanese-style right-to-left format now, though. Otomo: Yes, lately I hear that they want to publish manga in their original form, but it wasn’t that long ago that they simply wouldn’t have it. America in particular used to go on about how they have their way of reading comics. Europe was okay with using the Japanese style, though. Inoue: Another change is the shift toward e-books. 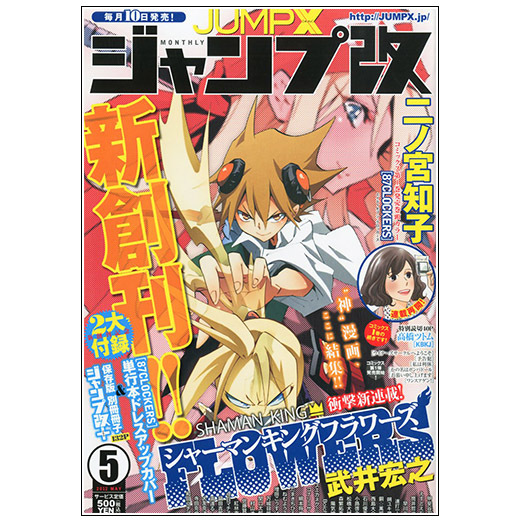 Even the monthly Shonen Jump ⑪ magazine they were putting out in America has recently stopped being published [and a weekly digital version has started instead]. Otomo: Things are going to be different, definitely. Look at musicians — they’re moving towards putting out music under their own labels. I like going to bookstores and record stores, so I’m not sure how thrilled I personally am about this, but anyway. Inoue: Manga have always been drawn under the assumption that they would be made into printed books, so you really can’t just go turning them into e-books just like that. The situation in Europe is such that it’s hard for manga to catch on unless it’s in e-book form, so I do feel that it’s a problem that maybe I need to deal with. I’d like to do some thinking about what things e-books could allow me to do. 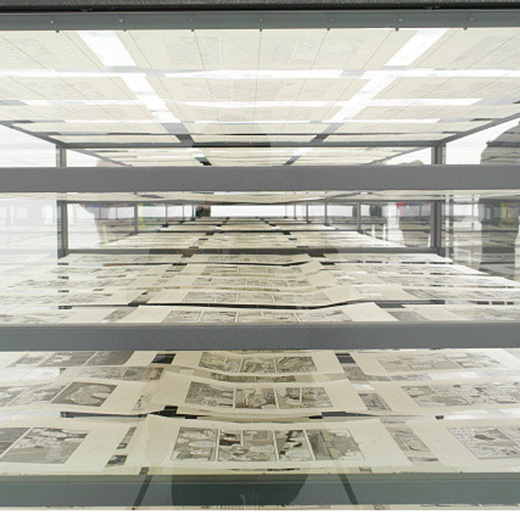 Otomo: It really won’t be the same if it becomes a matter of scanning manga drawn on paper and viewing the images on some sort of device; we probably would have to do things differently than when people were reading manga on paper. There are all sorts of people out there, though, and I think it’s best if the artist decides how he wants to draw his work and put it on the page. ① Akira. 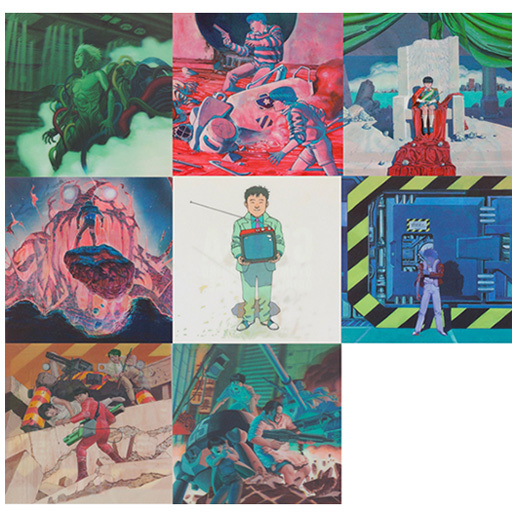 Is Katsuhiro Otomo's seminal manga published from 1982 to 1990 in Young magazine and homonym anime film released in 1988. ③ Ashita no Joe (あしたのジョー) boxing manga written by Ikki Kajiwara (梶原 一騎) and illustrated by Tetsuya Chiba (千葉 徹彌) that was published in japan between 1968 an 1973. ④ Kyojin no Hoshi (巨人の星) is a Japanese sports manga written by Ikki Kajiwara (梶原 一騎) and illustrated by Noboru Kawasaki (川崎のぼる) that was published in japan betwen 1966 and 1971. ⑤ Shuji Terayama (寺山 修司) was a Japanese Poet, dramatist, writer, film director, photographer considered by many one of the most productive and provocative creative Japanese artists. ⑦ Slam Dunk (スラムダンク) is a manga by Takehiko Inoue (井上雄彦) that was serialized in Shueisha's Shonen Jump magazine between 1990 and 1996. ⑧ City Hunter (シティーハンター) is a manga by by Tsukasa Hojo (北条 司). 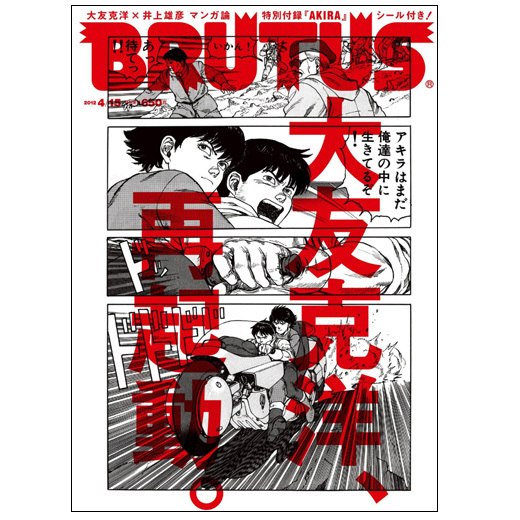 It was serialized in Shueisha's Weekly Shōnen Jump from 1985 to 1991. ⑨ Vagabond (バガボンド) is a manga by Takehiko Inoue (井上雄彦) that started it's serialization in Kodansha's Morning magazine in 1998 and portrays a fictionalized account of the life of Japanese swordsman Miyamoto Musashi (宮本 武蔵), based on Eiji Yoshikawa's (吉川 英治) novel Musashi. ⑩ Mapping pen (丸ペン) is a type of pen used to make thin lines. 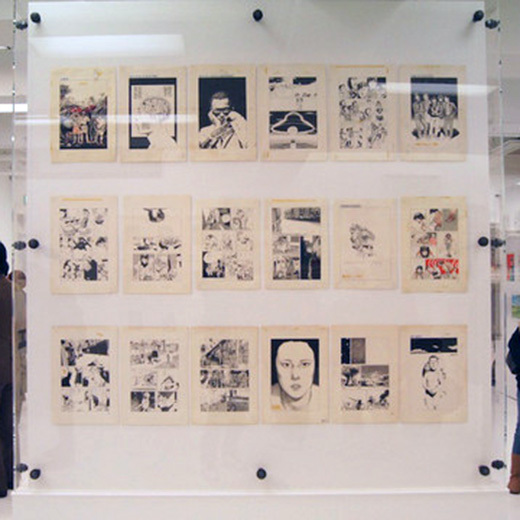 Otomo regularly uses them for drawing his manga. ⑪ Shonen Jump (少年ジャンプ) is one of the most successful weekly manga magazines published by Shueisha since 1968. 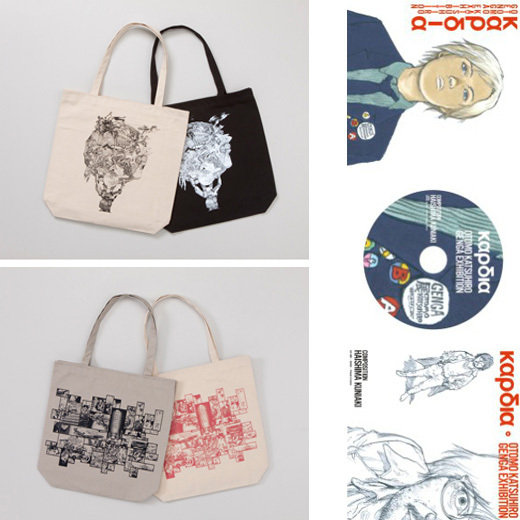 Katsuhiro Otomo has drawn various illustrations for the package of the album Καρδια OTOMO KATSUHIRO GENGA EXHIBITION BGM by Kuniaki Haishima (蓜島邦明). 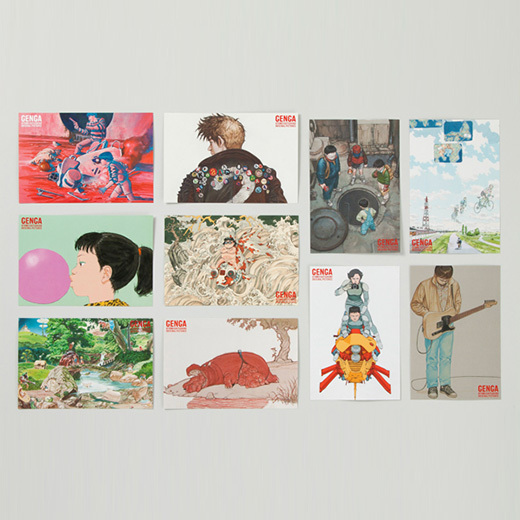 The album contains a 49minutens long single track that was used as the background music in Katsuhiro Otomo's GENGA TEN (大友克洋GENGA展) exhibition.